Women in Scotland are the first in the UK to be allowed to take the abortion pill at home. Scotland’s Chief Medical Officer has written to all health boards to say the drug misoprostol can be taken by women outside of a clinical setting. The change brings Scotland in line with other countries such as Sweden and France. There were 12,063 terminations of pregnancy in Scotland in 2016 and almost three-quarters (73.5%) were carried out at less than nine weeks gestation. The vast majority of these early terminations (89.4%) were medical rather than surgical procedures. The medical treatment involves taking two different medicines. The first tablet, called Mifepristone, blocks the action of the hormone progesterone, which is needed to maintain the pregnancy. The second tablet, called Misoprostol, can be given on the same day, or 24, 48 or 72 hours apart. Not all women are suitable for a medical abortion, although they may still be suitable for a surgical abortion. 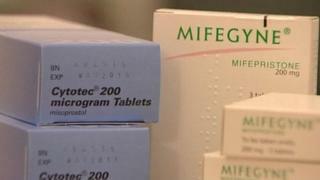 The change in Scotland would mean the second tablet Misoprostol – would be administered in a clinical setting but could be taken by women at home. Within an hour of taking misoprostol women often experience heavy bleeding – usually on the way home from the clinic. This is a particular concern for women in Scotland who often have to travel long distances to access abortion and maternity services. The Scottish government said it was making the changes under existing abortion powers. Public Health Minister Aileen Campbell said: “Abortion can be an emotive subject – however I am proud this government is working hard to ensure women are always able to access clinically safe services. Ann Furedi, chief executive of the BPAS, welcomed the decision. “It is simply perverse that a woman arriving at a BPAS clinic in England and Wales with an incomplete miscarriage can be given the medication to take in the comfort and privacy of her own home, while a woman seeking an abortion must take that same medication on site. However, John Deighan, chief executive of the Society for the protection of Unborn Children (SPUC) Scotland, said the change would mark “a return to the days of back street abortions with no medical oversight”.